Some will tell you that coveting a six-pack is vain, and you'll have to needlessly suffer to get it. Danny Kavadlo disagrees. Here's his plan to help you achieve the abdominal dream! Not that long ago, you might have only known Danny Kavadlo as a mug and tattooed torso in other people&apos;s work. He was brother Al Kavadlo&apos;s erstwhile companion in books and articles, or in Paul Wade&apos;s "Convict Conditioning" series of books. All that has changed in the last year, as the elder Kavadlo—long a sought-after trainer in New York City—has come into his own as an author. 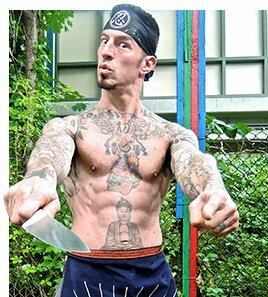 His popular articles for Bodybuilding.com such as "How To Build a Calisthenics Body" and "Look Like A Badass After Age 40" showcase a voice every bit as strong as his body. He&apos;ll master—and walk you through—feats like the one-armed human flag, but also throw off his trainer mantel and dive into discussions of diet and lifestyle in a frank, unpretentious style that&apos;s perfect for the strength minimalist. In short, he knows you want to be strong, but look strong, too. The two goals coalesce in his second book, "Diamond-Cut Abs," a complete guide on how to train, eat, and live life to the core. He discussed the book with Bodybuilding.com shortly after its release. What is the importance of having cut abs? What does it symbolize for you? The title "Diamond-Cut Abs" refers not only to lean abs with visibly deep cuts, but to diamonds themselves, which are regarded as the world&apos;s hardest substance. Diamond-cut abs are both sculpted and hard! Further, considering the value of the diamond as a precious stone, the title is a metaphor for the value of having a strong, carved, powerful midsection. The importance of owning diamond-cut abs on a functional level is obvious. You use them every time you stand, sit, flex, twist, and more. "Abs training should be performed in addition to—not instead of—a complete program." The importance of having diamond-cut abs on an emotional, sociological level is more complex. In our culture, the image of the ripped, shredded six-pack is everywhere we look. From the movies, to the magazines, to the advertisements, abs are everywhere. Love it or hate it, such is the world. To deny our cultural focus on abs would be silly. In fact, I&apos;d say that just about anyone who has ever worked out in any capacity has at one point or another—even if they won&apos;t admit it today—focused specifically on their abs. Why not embrace it? Where should abs fit in the priority list of someone who doesn&apos;t have them, but also wants to build strength? Let me be perfectly clear about something: Just because someone has shredded abs doesn&apos;t guarantee that they are strong—or even fit. There are people with a six-pack who can&apos;t do 20 good pushups or run a mile. Abs are not a cause of overall fitness. That said, there is definitely a large correlation between the two! No matter your abs program, there is no substitute for full-body strength training. You must still squat, push, and pull. Don&apos;t worry; these exercises are good for your abs, too! For the record, any abs training should be performed in addition to—not instead of—a complete program. You discuss cooking and nutrition a lot in this book. Did your interest in these blossom with your interest in calisthenics, or long before? I started out in calisthenics when I was a young kid. I got into cooking as a teenager. I believe that the only way to truly know what you&apos;re putting into your body is to prepare it yourself. "Measuring every little thing you eat is no way to live. Deprivation is never a turn-on either." It took me many years of experimentation to find out which eating styles work best for me, not just in terms of abs, but in terms of life. Measuring every little thing you eat is no way to live. Deprivation is never a turn-on, either. I see many parallels between cooking and calisthenics. I don&apos;t like to adhere to a rote workout, the same way I don&apos;t like specific recipes. I believe in going with the flow, improvising, and adapting to suit your taste. If you want to add a few more pull-ups—or garlic—to what you&apos;re working on, I say do it! You&apos;re known for some pretty incredible feats of core strength, like the human flag. Are lofty goals like that necessary to build cut abs or a "calisthenics body?" While the human flag is indeed a fantastic feat of strength and discipline, requiring brutal abdominal power, it is definitely not necessary if your goal is to forge an iron six-pack. 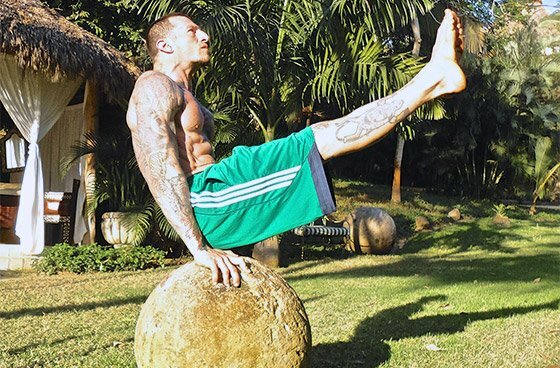 The abs I talk about in "How to Build a Calisthenics Body" and "Diamond-Cut Abs" are the type of abs acquired when you get off the machines and become one with the environment around you, stabilizing with your abs—and full body—in every rep of every movement, thus eliminating the notion of total isolation. All the exercises detailed in "Diamond-Cut Abs" subscribe to this premise. Coffee, milk, bananas, cashew butter, apples, bacon, eggs, cheese, lamb chops, broccoli, olive oil, garlic, and red wine. Also, lots of water throughout the day. As I previously said in "Eating for Ultimate Abs," when you eat good food most of the time, and don&apos;t obsess over the components of food, it is likely you will both enjoy every meal more and look better with your shirt off. "They&apos;re the type of abs that are acquired when you get off the machines and become one with the environment around you." You&apos;re also a big fan of homemade juices. Got a good recipe for us? I started juicing many years ago, and continue to do so several days a week. I love to incorporate as many different flavors and colors as possible. Fresh juices flush your system with nutrients and vitality while giving your digestive system a much-needed break. Plus they&apos;re delicious! Here&apos;s a classic recipe I enjoy: beet, spinach, apple, and red pepper. Serve with a twist of lemon. Enjoy! You talk about some interesting approaches to fasting: fruit/veg fasts, juice fasts—not just "not eating" fasts. How do you blend these? I explain in the book that I&apos;m using the word "fast" to mean that one abstain fully (or partially) from some (or all) food. There is a lot of room for interpretation here. By this open definition, being a vegan, going grain-free, or eliminating dairy would all be mild forms of fasting. Having said that, I approach all fasts by being present-minded. Think of it as, "Hey, I&apos;m eating an apple now," rather than, "I&apos;m only eating apples for three days." It&apos;s much in the same way that when I perform an L-sit, I&apos;m just doing an L-sit, not thinking about holding it for a minute. In fitness and life, it&apos;s important to be inside the process, not just chase the goal. "In fitness and life, it&apos;s important to be inside the process, not just chase the goal." Sometimes just having fruits and vegetables for a day can really change someone&apos;s approach to eating. The guidelines do not have to be set in stone. I even say in the book, "If you really need a banana, then have one. It doesn&apos;t mean you failed." We build up an awful lot of toxins, gratuitous fat, and nasty chemicals in our bodies. It&apos;s important to hit the "reset" button once in a while. There are so many gimmicky fads out there, like having nothing but a specific brand of lemonade, packaged pepper product, or extreme crash cleanser, that I had to share my take. It&apos;s simpler than you might think. Do the Kavadlo brothers ever wear shirts? Yeah, I think there may be a few photos floating around the web. You and Al recently got back from a teaching tour in Europe. How does the response to progressive calisthenics there compare to the U.S.? My brother and I are blessed in that we get to travel the world and connect with other calisthenics aficionados everywhere. It&apos;s unbelievable. In terms of comparison, I&apos;d say that there&apos;s a lot more in common than apart. That&apos;s the amazing part. Whether we&apos;re in the United States, Europe, Australia, or wherever, the passion and kinship of the calisthenics community is something we see time and time again. The love of movement transcends any potential linguistic or cultural boundaries. We love it! Strong men and women work for years just to be able to hold a human flag for a few seconds. But if you think that&apos;s where the story has to end, you don&apos;t know Danny Kavadlo! You think you need a strict dietary system to see your six-pack, but it just ain&apos;t so. All you need is common sense, control, and a solid overall approach to nutrition! The rules of fitness don&apos;t change when you enter your fifth decade of life. But living the lifestyle becomes more important than ever. 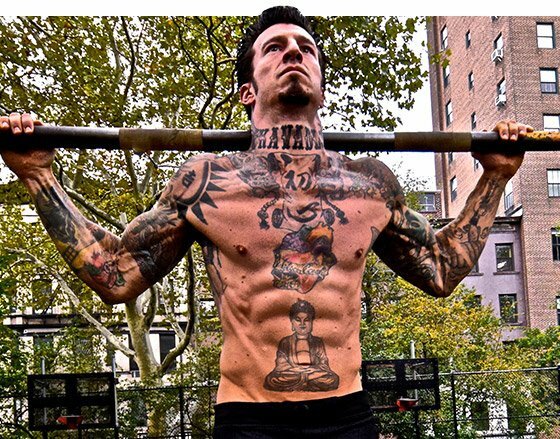 Danny Kavadlo soared into his 40s like a ripped human flag and wants to show you how to do the same!